Hi guys. I don't have too much time today on a detailed post. I raced today and I have a hilly one tomorrow as well. I imagine I'll be putting a good 70 miles in racing and close to 100 miles in riding on both these days alone. I think I need every bit of outdoor hills now, even if the weather is in the sub 30's. I believe I did mention that I'm racing the Tour of Battenkill in an earlier post. FYI, it has become the biggest one day road race in America! And its hardly a month away! Anyway, just in case you still didn't get it, here's a slightly old but nice article describing what a helmet is made of, how it works and a little bit of interesting history to go along with it. Enjoy! Helmets work by bringing the head (and brain) to a relatively gradual stop upon impact. 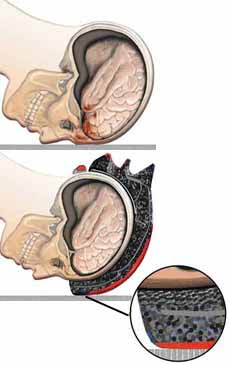 When an unprotected rider strikes his head against a hard surface, inertia causes the brain to slam forward against the skull, which can cause bruising and internal bleeding. Helmets soften the shock by gradually crushing to absorb impact energy. The outer shell will crack but still remain intact. The helmet's body, composed of fused polystyrene beads, is compressed as it absorbs energy to cushion the blow. Cyclists realized early on that headgear was a good idea. In the 1880s, the direct correlation of bicycle-related head injuries with the increasing miles of hard-surfaced asphalt and macadam roads gave rise to riders wearing pith helmets. Pith is a crushable material that is able to absorb some shock, but it virtually disintegrates upon impact. Still, a disposable helmet was better than none at all. Pith gave way to a padded leather covering--a design that lasted into the 1970s. Worn primarily by racers who referred to them as "hairnets," these helmets were quite attractive, with their soft Italian leather exterior attached to a foam liner. Unfortunately, they offered little or no impact protection, but they did save a rider's ears from being ground off as he slid over the pavement. The soft shell helmet was the next major development. Looking like a salad bowl with few vents, this headgear used a shell made of polystyrene, a material similar to that used for picnic coolers. A Lycra cover and inner foam pads attached by Velcro were added later. Bicycle helmet standards for impact resistance and strap retention were introduced by the Consumer Product Safety Commission (CPSC) in the mid-'70s. These and other performance parameters were drawn from various sources such as the Snell Foundation, the American National Standards Institute and the American Society for Testing and Materials. At the time, only light motorcycle helmets met the standards, but cyclists refused to wear them because the helmets were too hot and heavy. Bell's Biker was the first bicycle helmet to meet the CPSC standards. It was constructed of an ABS plastic shell taped over polystyrene foam. 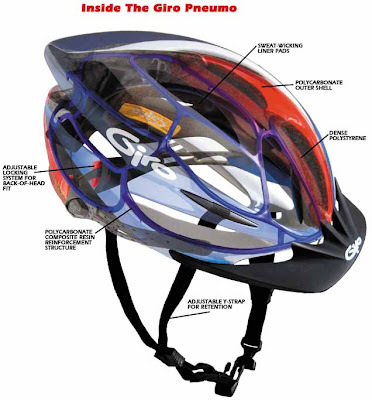 Newer shell materials, such as PVC in lower-end helmets and polycarbonate in more expensive models, have since reduced weight without compromising performance. A denser form of polystyrene has cut weight as well as bulk. Helmets must have the integrity to withstand primary (initial fall) and secondary (getting hit by other bikes) impacts. Stylewise, round shaped bicycle helmets are as out-of-date as Charo and the hoochie-coochie. Everyone is going with the low-profile angular look. Only a geek would ride around with something that looks like an overgrown walnut on his head. Vents are part of the style too, but their true purpose is to make the helmet cooler to wear. In case you hadn't noticed, there's a vent war going on. How many vents can you punch into a helmet? Limar's F111 ($155) introduced at this year's Interbike Show holds the record at 37 vents, up from last year's F107 model, which has 23. 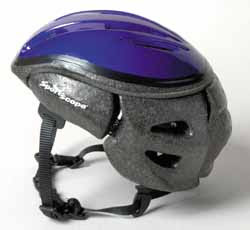 Mountain bike helmet vents, such as in the Bell X-Ray, are larger and less aerodynamic than their road bike counterparts'. They provide for more passive sweat evaporation at low speeds under a hot sun. CoolMax liners, almost universal in helmets these days, also help to wick away moisture. Helmets don't work if they slide back on your head or are ejected upon impact, so a lot of attention is being paid to a secure fit--especially at the back of the head. Bell has developed a Geared Positioning System to secure the back-of-head cradle inside the helmet. The Roc Loc--twin levers that lock onto a toothed strap--is Giro's answer to secure retention. And Limar uses a 10-position click-adjustment system to provide a snug fit across the board--this helmet comes in only two sizes. Sportscope helmets depart from standard one-piece construction and use six segmented panels joined by a strong, flexible nylon mesh. The separate panels expand and contract for a customized fit. The design eliminates the need for fit pads and reduces the distance between the helmet and the skull, so the helmet is more stable. Bike helmets are a proven lifesaver. According to the Insurance Institute for Highway Safety, 98 percent of bicyclists killed in 1999 weren't wearing helmets. 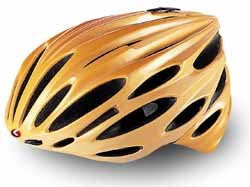 In the event of a crash, wearing a bicycle helmet reduces the risk of serious head injury by as much as 85 percent. Helmets not only look cool, they are cool. Those aero vents on road bike helmets reportedly keep your head cooler than riding without one. And you know that other old saw--cooler heads will prevail. interesting... this would be a good explanation of why I sustained a stage 3 concussion during my car/bike collision and not death. I'm a strong believer of wearing the helmet now, and I'm trying to convince my non-helmet wearing friends to wear one as well! I've never known how exactly a helmet works, but it all makes sense now with absorbing the impact energy and all. It's compulsory here in Australia to wear a helmet. It certainly saved my head a few times. How did you go in your race? That's the idea. Pity the foam's too stiff. To quote from the senior engineer of Bell Helmets: "Another source of field experience is our experience with damaged helmets returned to customer service... I collected damaged infant/toddler helmets for several months in 1995. Not only did I not see bottomed out helmets, I didn’t see any helmet showing signs of crushing on the inside." Full reference in the Wikipedia article on bicycle helmet. Zachary and Groover, did your helmet foam get crushed? I'm looking for examples, preferably with photographic evidence. If so, it would be very unusual and also evidence that your helmet actually worked as designed. Zach - You've been wise and lucky too. Groover - The race on Sat was blazing fast in almost freezing conditions. I hope to write a small report or something. Anyway,what happens if a cop catches a cyclist not wearing a helmet? Fines? Interesting. Thanks Ron. Correct me if I'm wrong but these helmets look bust to me - failed - rather than having compressed foam as is the design intention. Good observation. My greatest curiosity is how they come up with the design criterias for these helmets. That wikipedia article you pointed to states that simulation of speed of impact usually leaves out rotational energy and impact from other vehicles.. So maybe we can assume the helmets in the links above involved some violent crashes? At the same time, you would think that the outer shell would crack and break easily since its polycarbonate composite. They are brittle after a point. Today's performance helmets have so many vents in them that I feel it takes something away from the overall structural rigidity of the helmet itself. At the same time, to keep these things 'lighteight', in tune with the competition in the market, you can have only so much material of construction in them. This is the slight irony of building something that is supposed to protect your head. Ron - looking forward to reading your race report. Richard - you are correct. No signs of damage on the inside of the crashed helmets. Interesting isn't it? You won't be surprised to hear that my helmet has been gathering dust in the bike shed for years now. These things really do not seem to work as designed. They may protect against grazes, but if the ideas on rotational injury are correct, they may dump the energy into the brain instead. And they may also increase the chance of having accidents. Why those standards? I don't know, and the senior engineer of Bell didn't seem to know either. Where did you find that picture of Michael Rassmussen? Always, always, wear a helmet. Groover - Wow, that is a long way off from here. Now, I only race in the north western part of the United States, so I'm not sure whether something on the lines of the rules enforced in Australia can be seen elsewhere in this country. Some folks like the idea of enforcing helmets but theres a lot of others who think that its something that should be left to the discretion of the racer. Richard - If you learn anything new about helmet design, let me know. There wouldn't be any crushing inside, would there? Because the inside conforms to the head shape, while the outside is what gets hit by curbs, flat surfaces, etc., which would distort the surface. On the inside, the load gets distributed over the entire hemisphere of the head. After testing on the standard rigs, what we get, I'm told, is crushing on the inside. What I've seen after accidents is fracturing of the rather fragile material, and superficial grazing. I presume that this should avoid scalp grazes, which can be quite nasty, but will equally dump energy inside the head, rather than using the scalp as a shock absorber for the brain. The Conehead helmet is only available for motorcyclists, but may actually absorb energy as intended. The Phillips helmet - again for motorbikers only - is designed to absorb rotational energy. There seem to be no plans to make either of these advantages available for us. I doubt I'd bother with a helmet even if they were - the risk just isn't high enough - but if there were helmets that worked I'd certainly consider them. Channel's 'How its Made' series, I watched a testing in a helmet for a similar, if not completely different, application - football. They hooked the helmet to a movable part to mimic the head, filled with sensors and strain guages, and then let the helmet hit the ground, monitoring on a computer the peak forces encountered. However, it was a strictly one dimensional 'fall' and no rotational or other possible crash scenarios were replicated. I hope that cycling helmet manufacturer's do take into account these things, and while lightening the helmet, do not severely affect the amount of foam or padding that is a vital protection against impacts to the head. 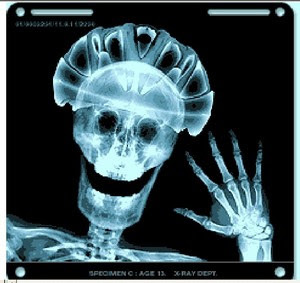 The fact is,however, that cycling helmets have caused a spectacular drop in several injuries and that's a good thing. I do hope that the trend continues to be one so. I have had the foam compress in my helmet in an accident. Back in 1990 I hit the fender of a car (yes, I hit the car, it was my mistake, not his), flew off the bike, and my helmet hit right above the windshield, putting a large dent in the curved edge of the roof. I flew off the back and was unconscious for ~1 minute. Came to just fine but with some road rash. Didn't even have a headache afterwards. The helmet was an Avenir hardshell helmet, and yes the foam compressed. I hit the left front of the helmet and the foam went from its usual 1/2-3/4" thickness down to ~1/8". I seem to remember that there was a couple small cracks in the foam as well. I think the major difference though is the photos linked above are for thinshell (or no shell) helmets, and the shell can't hold together before the impact forces shatter the foam instead of compressing it. With the old hard shell (1/16" hard plastic) helmet, there was only a couple abrasions on the outside, and that was from the road, not the car. Somewhere I might have some print photos of the helmet after the crash. I'll make a note to get back here or email ya if I can find and scan them. Ian, this is really interesting; it's the first time I have ever heard of a helmet showing convincing evidence that it has worked as designed. I'd be pleased to see the photos, even more pleased if you can give me permission to pass them on, preferably with some details of yourself as the source. Helmets actually don't seem to make any noticeable difference to head injuries, and they put people off cycling. Richard : Thank you for your continuing interest. I think we can develop a case here. Oh, I'll read that link you sent me thanks. Ian : If you could reference those images with a link here or even email me with them, that'll be great. Ian, if you could also email me, dr.richard at keatinge.net, that would be great. Here's another helmet from a crash. Note entire right side of helmet has split apart. Yes, helmets are very fragile, aren't they. Seriously, there seem to be far more helmet-saved-my-life stories than there ever were serious head injuries. And the figures, see above, just don't support any useful effect of helmets. I realize that many people are absolutely convinced that a a helmet has saved them, and arguing with them is a bit of a waste of time, but I do wonder if all (or any) of the stories are actually correct. I would have to agree with Richard. It is a pity that people still ride the dangerous "safety bike". In discussing the types of injuries received from recumbent bike crashes with the BicycleMan (in NY, USA), it was mostly broken ankles. I'm late to the party, but that doesn't mean I don't get a piece of what's left of the punch. Like some of you, I'm skeptical of a lot of the "my helmet saved my life" stories. On the other hand, here's an account of where NOT wearing a helmet changed my riding partner's life forever. Will a magic foam hat protect you from an encounter with an 18-wheeler? Of course not. On the other hand, in this case it would have been the difference between bruises and road rash versus five skull fractures. Your picture of What Helmets Do almost exactly illustrates my friend's crash, except that she landed on her right temple, then flipped over and had a second blow the the back of her head. Hmmm, rotation- certainly a smooth/rounded shape can rotate best. What I think you are all missing is the psychological aspects of helmet wearing. Not only does it remind the cyclist that they are on a bicycle, it also is a visible sign to a driver that there is a cyclist in view. The visibility of the cyclist compared to the background environment may even be more important. Perhaps studies should focus on the color of the helmet. Health costs for illness from people not exercising (cycling) and extra deaths exceed the reduction in deaths from helmet wearing. Those statistics are available. I choose to wear a helmet - I have to wear something to keep the sun off, it might as well protect my head as well. why do you think so many people don't wear helmets??? THEY MAKE YOU LOOK LIKE A DORK !-----yeah, yeah, "I'd rather be a live looking dork than a dead or paralyzed one". Until they make helmets that don't look like helmets, most people won't wear them. Compulsory Helmet Laws are ill-founded. I would like to see some statistics that really show an improvement in safety based on total distance cycled for a population. One of the main reasons why we've seen a decrease in cycling injuries in Australia (not just head injuries) is that there are a LOT fewer people cycling since compulsory helmet laws were introduced! The cycling rate plummeted! Most of those that continue to cycle are the sporting, lycra-clad racers that often only cycle on a weekend. I wonder whether, on a per-km basis, this group actually has a HIGHER risk of head injury? Perhaps helmet use might seem sensible for this group? Indeed, even for this group, I think it should be optional for us to choose if we should wear one. Anecdotal stories, while compelling, should NEVER be used to confirm or deny the utility of something like helmets. As a medical doctor, if I were to change my clinical practice in emergency medicine based on some horror stories from colleagues (or myself) then healthcare would go down the drain. We have EVIDENCE BASED medicine in Australia, and for good reason. If there is no credible evidence for a given practice, then it should be abandoned. This evidence is independent (ie. no drug company (read: helmet company) evidence is acceptable). I don't think compulsory helmet use is sensible for city utilitarian cycling on a non-racing/mountainbike. If we think it IS then perhaps we should be enforcing compulsory jogging helmets too? Where exactly do you draw the line? When I was a child growing up (in the 70s & 80s) I and all my friends cycled to and from school and to each others houses, without helmets. The bicycle racks at schools & universities were FULL. Now sadly you will be lucky to see a handful of bikes at schools. We did some crazy things on our bikes and I knew of nobody that had a head injury from a fall. Cuts, abrasions, broken wrists, collar bones, etc were common, but not head injuries. This notion of portraying cycling as a dangerous activity, and one that requires the cyclist to 'be more careful' helps us all ignore the elephant in the room in our society - that car drivers do not give cyclists & pedestrians the respect they deserve. This requirement for high visibility vests, helmets, etc portrays cycling as dangerous and it is little wonder so few children & adults ride bicycles as a sensible form of getting from A to B. If they get hit then it is 'their fault' for not being visible enough! If you want to wear a helmet then you should be able to make that choice a human. But the reverse should also be just as valid. I choose to not wear a helmet and I cycle mostly on bike paths, carefully with traffic if needed (obeying all traffic rules, respecting others) and I find I am given more space and cars pass me slower on the whole than when I wore a helmet. I ride an upright Dutch City Bike and car drivers see me as a person, not a racing machine. Great story as for me. It would be great to read more about this topic. Thanx for sharing this info. The good Australian Dr. should practice falling three feet with and without the helmet; standing still and in motion. In ten years of cycling I've used my head to break my fall four times and I'm still typing these words.I believe the helmet saved me noggin. We would be better served as cyclists by examining the fragility that is our brain bucket...one then immediately recognizes that the polystyrene has an added 'ounce of prevention.' Brain trauma appears to be FOREVER...so I would advise those who want to ride to wear the bucket, compulsory or not. I've not fallen off my bike since I was 10 years old - that was 30 years ago and I ride over 2000km per year. Perhaps you're doing something wrong, taking unnecessary risks, or not reading the road correctly? I would hazard a guess that I know a lot more about brain injury and the mechanisms of injury than you, but thanks for setting me straight with yet another anecdote... you've proven my point actually. Show me the evidence that you would have had a 'serious' brain injury if you weren't wearing a helmet... more likely you would have had a few bruises and a scalp laceration or two. Big deal. The person that wrote that they have to wear something to keep the sun off, so might as well wear a helmet - what kind of helmet do you know that works even half as well as a wide brimmed hat for sun protection? If you are bald, or your hair is thinning you will end up with sunburn at all the vent holes. That is quite interesting article about how helmet works. That is why I suggest people to wear helmet. It provides safety to the head and prevents internet brain injuries which can be very dangerous.